Rockstar’s open-world Western with DLC offering nine new multiplayer maps, over 25 new multiplayer characters, additional new multiplayer weapons and new trophies. Oh, zombies, too! Cole MacGrath returns in SuckerPunch’s action adventure hit. Help save New Marais from the Beast, and itself. This survival horror shooter from 2K Games picks up eight years after the ending of the first BioShock. The DLC brings you an increased multiplayer rank (up to 50), 4 new multiplayer characters, 6 new multiplayer maps, 6 new trials maps, new weapons, trophies and trials. This intense racing game from Evolution Studios gives you over 40 tracks based in The City, on the west coast of the United States. Play through the Festival solo, in couch co-op, or online multiplayer. Treyarch’s latest CoD installment speaks for itself. We’ve added all four Map Packs to this Ultimate Edition, bringing you over 20 new maps and new playable characters. Help Cole Phelps clean up 1947 Los Angeles in this captivating open-world crime adventure from Rockstar. This Ultimate Edition includes plenty of additional cases for you to solve. 2K’s third-person action-adventure sequel offers a gritty mid-century gangster experience you’re sure to enjoy. DLC adds new missions, new clothes and new cars. This Avalanche Studios title places you in the fictional Pacific island of Panau, giving you an open-world adventure experience you’re sure to remember. This Ultimate Edition includes new weapons and vehicles for you to enjoy. Get the latest version of this 2D fighter classic along with Klassic Costumes for Sub-Zero, Scorpion, Reptile, Mileena, Kitana, Ermac and Jade. Add in new warriors Skarlet, Kenshi, Rain and Freddy Krueger and you have this unbeatable Ultimate Edition. These are deals that simply cannot be passed up. And check out the extra savings for PlayStation Plus members – there’s never been a better time to join! Make sure that you check out the PlayStation Store this Tuesday for the Ultimate Editions and round out your game library with these amazing collections. Wonder if Infamous 2 will get a Complete Edition on disc? arkham city doesn’t get a digital ultimate? Not at this time bouncingsoul, but that’s a good suggestion! For, now it’s just the titles listed. I don’t know what to say; I’m just IMPRESSED! Thanks favian and triedallthem. We really are excited about this, and it’s great to see that you are too! These are some pretty amazing deals. What does complete edition of inFamous 2 include? Already have Infamous 2 and Mortal Kombat so those do me no good, and the others im not even interested in. mixedkidbx, What titles would you have liked instead? @blairo32 i know huh……. also can we buy them without dlc? This is the greatest PSN sale of all time. That Just Cause 2 deal is MINE. Ok I already have 4 of those games and all the dlc, the rest don’t look appealing in the least! Pass! Nice, makes me happy I just put that 1 TB HDD in my PS3. I’d love to see the Elder Scrolls and Fallout games join in this. The DLC packs for those games would make this especially appealing, IMO. Just curious, does this mean that the regular editions of these games will be on sale as well? Or just these titles? For now, it’s the bundles on sale for a limited time. Mafia 2 was surprisingly good. People should check it out. Also, I’d like to see this for Vita games. Man I was hopping that the fallout games would be on this list. These are some really good games though! Keep up the good work and the good content coming our way! That would depend on if you only doing games that have been out for awhile and have DLC, or if you doing things like including games like Assassins Creed where all the games would be bundled together. I never played any of the Assassins Creed but if you was to do a bundle with all the games together for a reasonable (meaning the combination of those games shouldnt be more than current retail price [which you guys tend to always charge more for games than what retail sells them for]), then i could get behind something like this. This new promotion could be something great, but at the same time you guys could end up making it bad. Depends on how you play your cards…. That’s a good suggestion. No promises, but anything is possible. Thanks for the honest feedback. Also, how far in advance will we be made aware of for games that launch on PSN the same time as retail editions? I liked how they did things for Mass Effect 3 and Sorcery, just want to see more games as a digital launch as well. Will we see Black Ops 2 launch on PSN on November when it does for retail? Great idea, and some really great prices. Finally getting into the territory where the digital is looking as attractive as a used copy or a rental, plus the devs actually get money this way. Those asking for Arkham City are being totally unrealistic, the physical GOTY edition for that JUST came out. It would be nice if the downloadable content was also on sale for those who already own the games, but a great offer nonetheless. Clarification, does Festival of Blood come with the Infamous 2 bundle? Sorry for the delay on this reply but I wanted to make sure. Festival of Blood is not a part of the InFAMOUS2 Ultimate Edition. You guys should do a sale like this for all of the “Collections” (Sly Cooper, God Of War, Ico & Shadow Of The Colossus, etc.). 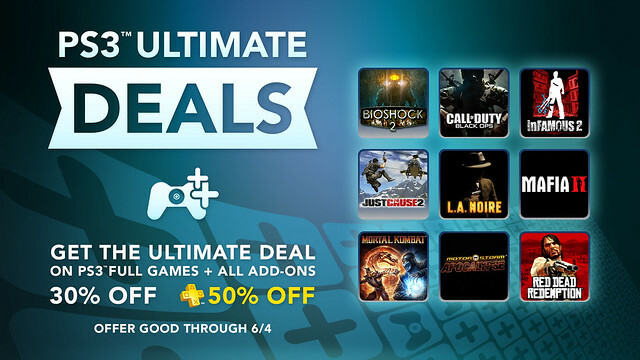 Cool new promotion and for the most part decent deals for PS Plus although would be great if they were on some more recent games, but Motorstorm Apocalypse for $50 or $35 with PS Plus… You can find the game alone for $9 and buy the DLC separately. Moreover, some of these game’s online community have died a long time ago or have diminished greatly which would make MP DLC a bit worthless. What no Super Street Fight IV Arcade Edition or BlazBlue CS Extend? Great news on Mortal Kombat, just what I’ve been waiting for before I purchased the game. Motorstorm is a bit more than I’d hoped it would be by a whole 10 dollars for Plus. Still a good savings. These are the current prices or discounted already? I will probably end up getting Just Cause 2, but not sure, I will have to see if its any good first! A couple folks have asked this and I’m double checking to be sure before I post a reply. I’ll get back to this as soon as I get confirmation. Thanks for listening. Also please remember than not everyone is into shooters like me. Shooters have never been something i really got into much, yet it seems like the 80% of games are shooters now a days. I just wish those of us who arent into the shooters had more options. I’m definitely getting inFamous 2 at that price, but what comes with it? It doesn’t specifically mention Festival of Blood (which I already have), so I assume that’s not part of it. It would be REALLY helpful to know in advance what games will be made downloadable. I have 2 PS3s now that can’t play blu-ray discs. Who knows when my current one will stop reading discs as well but if I can download them then my problem would be solved. Nice! Wow, wait a minute. Why does Motorstorm Apocalypse still cost so much? its been out for a year now, wth. Mortal Kombat: Just the PS3 version, or the PSV version as well? Just kurious. Make a “Move games” sale next, please. I have a question my account is a sub-account and i want playstation plus on it. im over 18 but i don’t know if i can since my account is sub. and if i can will be will i loss any features? How long is this sale going on for? I would love to pick up Infamous 2 and Mortal Kombat, but it would be preferable if I could wait until Thursday or Friday. The sale goes through 6.4. So you have a bit of time, RetroMG. Recent games: Modern Warfare 3, Final Fantasy 13-2, Batman Arkham City, Deus Ex Human Revolution, Uncharted 3, Assassin’s Creed Revelations and Saints Row: The Third. @33 You can get PS Plus even if your account is a sub-account. Just that if you get messages to your inbox, it will go to the master account instead. You not alone. in june of 2010 my ps3 blu ray drive died and i bought a new ps3. 2 years later here i am again with that ps3 i had bought now the blu ray drive doesnt work either. Once again i have bought another new ps3. I NEVER had issues like this ever with ps1 or ps2 where i had to buy more than 1 system. Here we are on PS3 and i have already had to buy 4 new systems due to Blu ray failure with each failing 2 years after buying them brand new. The reason i dont do Sony’s extended warrenty is there is no guarantee that you would get the same system back which means a lot of your save data wouldnt be able to be transferred to the new system (due to locked saves) and the return time on getting the system back is far to long. It really is sad that this generation of PS3’s have a large Blu ray failure rate. Just Cause 2 for $15 (with PS+, $20 without) is a steal. Seriously. If you haven’t played it, buy it. The missions themselves aren’t very good, but screwing around in the world is super fun. A PS Vita sale is long overdue specially on a lot of the ports that came out for it and were grossly overpriced or games simply that don’t merit their high price tag. AWESOME! I’m just wondering: How long will the sale last? Max Payne 3 would also be a great candidate for this sale and what about a sale for pre-ordering new games over PSN that will be shown at E3? Such as pre-ordering say LBP Karting, Sly 4 and PS Allstars for instance and getting them for 20-30% off (Assuming that they would all appear on PSN)? A collection or Move sale wouldn’t be bad either… good reason to pick up Sorcery, Medieval Moves, Jak and Daxter Collection or Rachet and Clank Collection since they aren’t being advertised on TV anyway specially Sorcery with it being the Move’s killer app and all..
All good suggestions Kchow, thanks for that input. I’d totally buy Motorstorm if it was $20… and I’d totally buy Mortal Kombat if it was the one on the Vita. ARRRGGGG! Lastly, Mass Effect 3 would be a great candidate for this sale later down the road once more DLC is out for it. Plus, it would be great to get discount on the DLC itself as well for those that already picked up some of these games and just want to get the DLC. Also, could you guys list all of the DLC included? I really like the idea, and I know that the PSN team’s hands are probably tied by Sony proper setting prices, but some of these games (even with the bonus DLC) are just too expensive. You want me to go digital download instead of box copy? You need to make it worth my while. I just got a new box copy of Just Cause 2 for $12.99 in store. PSN’s has the DLC but no physical box and its $8 more…. The PS Plus prices are more attractive, but I think the PS+ prices are actually what the games should be for everyone…. If the games were cheaper I could see me buying a new hard drive (still original 60gig!) and doing this on PS3 like I do PC.